The Responsive theme is adapting to different screen sizes. 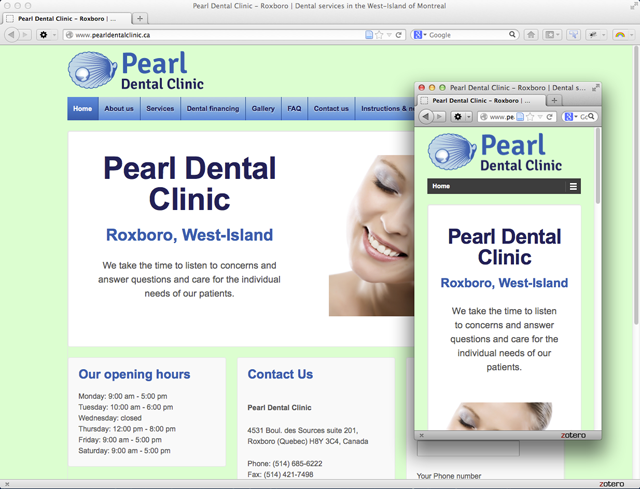 I just launched the website I designed for Pearl Dental Clinic. The website is powered by WordPress and the theme is based on Responsive Theme, that makes the website adapt to different screen sizes. The website is rich in information about dentistry and I really hope it’ll get many visitors and will bring new clients to the clinic. If you’re looking for an excellent dentist with lot of patience and kindness, int he West-Island of Montreal, than you should go to dr. Shafiei.